Weighty Matters: The Ewe Super High Carb Diet - 99.2% Effective! This one was yanked from the vaults by Whole Health Source's Stephan Guyenet. 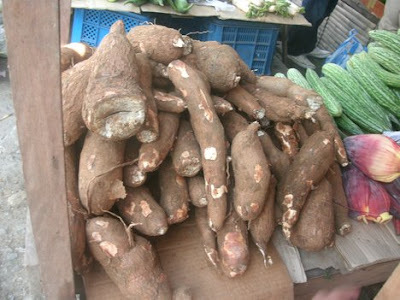 It details a 1987 study in the Lancet that involved exploring the diets, diabetes prevalence, and weights of 1,381 rural West Africans of the Ewe tribe who subsided primarily on carbohydrates which in their case primarily took the form of cassava roots (basically an African potato - that's it up above). The researchers estimated the Ewe's average calorie consumption by actually measuring their common food portions and reported that the average young male was consuming just under 2,000 calories daily with a macro-nutrient breakdown of 84% carbohydrates, 8% fat and 8% protein. The results were pretty straightforward. There was no detectable cases of diabetes as measured by blood glucose levels. Weight wise, mean BMI was just over 20. There were only 11 total individuals with BMIs exceeding 27 (0.8%). Weight wise the results aren't particularly surprising either as less than 2,000 calories a day for men will sustain a very lean weight. But what of the folks who believe calories don't count and it's all and only about the carbs?